We are all familiar with the benefits we derive from horse ownership, including the sometimes large contribution these gentle giants make to our physical and mental wellbeing, yet benefits accrue to the community as well from having horses in the neighborhood, ranging from socioeconomic to environmental. As horse ownership increases throughout the developed world, these benefits need to be better recognized and incorporated into land use planning efforts. The first step in making this a reality is an understanding of what types of benefits can be gained from encouraging horse farms in the landscape; only by realizing the types of benefits that can be provided by horse farms can their place in land use planning and the achievement of community goals be appreciated. Among these benefits are important contributions to the ecological health of the landscape, some of which are enumerated below. Provision of Wildlife Habitat. 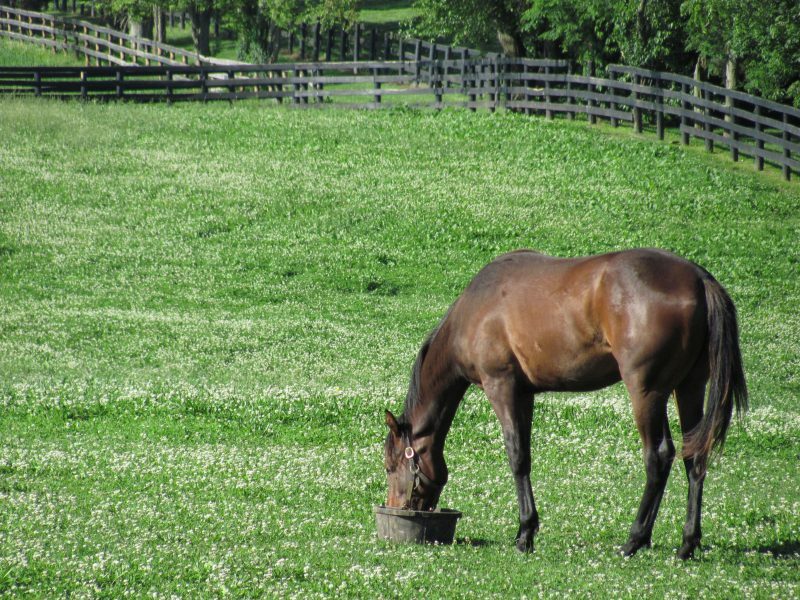 Most horse farms include large open areas that are left more or less natural and used as pastures, trails, or other minimally invasive uses. This practice leaves large areas of semi-natural vegetation, including meadow type spaces and remnant woodlands, which are perfectly suited to species such as deer, turkey, squirrels, rabbits, and other forms of wildlife, especially those that do well in edge habitats. Watershed and Stream Protection. Compared to other livestock operations, horse farms are more likely to utilize water troughs rather than relying on natural water bodies, primarily to prevent the horses contracting diseases from natural waterways. In many cases, this protection can extend to fencing off these natural water bodies, protecting their banks from erosion and minimizing sediment loads in the streams. This practice also provides a natural buffer between the livestock operation and the waterway, providing the opportunity for nutrients to be filtered out of runoff before it reaches surface waters. This protection can be ensured by requiring minimum buffer zones between manure piles, small paddocks, and other sources of highly concentrated animal waste and surface water bodies. Groundwater Recharge. In addition to protecting surface waters, horse farms can help recharge underground aquifers. Especially in the case of lower intensity farms, the large areas of pasture land and relatively low percentage of impervious surfaces allow ample opportunity for rainwater to infiltrate into the groundwater rather than running off into sewer systems or swelling surface waters. The benefits of locating horse farms over groundwater recharge areas result from their generally low intensity use and few chemical residues, meaning the water percolating through the soil will be cleaner and the groundwater will require less purification, saving money and time. Soil Conservation. A properly managed pasture retains at least 70 percent groundcover year round[i], as compared to traditional cropland which lies fallow part of the time with no stabilizing crop roots to hold valuable topsoil in place. Pasture land with year round grass cover helps prevent soil erosion, reducing sediment loads in surrounding streams and preserving the productivity of the soil and the nutrients in it. Reduction of Brushloads. In the western states in particular, where wildfires are a significant concern, grazing can help reduce the amount of brush and other dry matter available as fuel. Grazing is also more politically and socially acceptable than controlled burns for managing potential fuel loads. While these benefits can be realized from any horse farm in any location, they are especially important in the context of the rural-urban interface, the zone at the edge of expanding cities where suburbia bleeds into farmland. In these areas, open space is often disappearing faster than good planning can preserve or replace it. However, it is also in these areas that horse farms can flourish, taking over remnant pieces of once large agricultural properties or holding out as the last reminders of a formerly rural community, close enough to the urban area to have access to jobs or clients, while providing all the benefits of open, naturalistic space that the community might otherwise lack. One caveat should be included in this discussion. While all of the above benefits can be supplied by horse farms, they are best provided by well-managed horse farms. Good management such as the avoidance of overgrazing, the establishment of dry lots and avoidance of mud pits, and good manure management such as composting, greatly influence how much of a positive influence an individual farm has on the environment. For more information on best management practices and their benefits, be sure to check out the Best Management Practices section of the website. i Rebecca C. Bott, et al. “Production and Environmental Implications of Equine Grazing,” Journal of Equine Veterinary Science 33 (2013): 1032.
ii Mark W. Brunson and Lynn Huntsinger. Synthesis Paper: “Ranching as a Conservation Strategy: Can Old Ranchers Save the New West?” Rangeland Ecology and Management 61, 2 (March 2008): 137–147.